We often use the term “personal injury” as a medical term, to explain the results of an accident to strangers. But personal injury in the legal context is a claim made as a result of an injury caused by someone else’s negligence or intent. There are a number of different kinds, and no two personal injury cases are the same, but they all have the same legal function: to secure compensation for the injured plaintiff. One of the most common types of personal injury claims are car accident cases. Every year across the US, around 10 million people suffer injuries from car accidents. Many of these accidents were the result of someone’s carelessness, and one small attention lapse behind the wheel can have catastrophic, lifelong consequences for someone else. Experienced car accident attorneys help millions of plaintiffs every year in their quest for compensation against a careless or reckless driver. If you suffer a slip or a fall on a residential or commercial property owned by someone else, and you believe it was avoidable, and the property owner is liable for your injuries, you may be able to file a personal injury claim for damages. It is the owner’s responsibility to keep their property safe. If they were negligent in this duty, you could have a strong case against them. Medical malpractice claims are surprisingly common, and the effects can be tragic. More than 250,000 Americans die every year due to medical errors, making medical malpractice the third-leading cause of death in the United States. We entrust medical professions to heal and cure us, and they as practitioners have a duty of care to work in our best interests. When medical professionals do not fulfil this duty, by providing unnecessary treatment, acting incompetently, making an inaccurate diagnosis, or treating a patient against their wishes, they are vulnerable to a medical malpractice claim. Workplace personal injury claims are a common form of personal injury claims. If an employee is injured at work, they may be eligible to file for compensation. Workplace injury claims have stringent requirements, for example, the employer must be notified immediately after an injury occurs. There are also strict deadlines on how long after an injury you are eligible to file a claim. A personal injury attorney will be able to hear your case and decide if you have a claim against your employer. Worker’s compensation for workplace injuries do not cover pain and suffering damages, and your lawyer may decide upon hearing your case that you would be better-placed to file negligence damages instead. 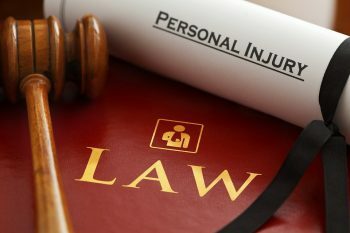 These are four of the most common types of personal injury claim; however, there are numerous others, including, dog bite injuries, assault and battery, and products liability. When a personal injury occurs, and it wasn’t your fault, contact an attorney that specialises in personal injury claims to find out what category your claim falls under and how much compensation you could be entitled to.